I thought about making biscuits and topping them with strawberries but I thought that might be cheating, plus I’m positively abysmal at making biscuits. I mean, I put forth some good effort here and there but the pictures you see on the blog as the few and far between successes. In addition to my inconsistent biscuit making abilities, I really wasn’t sure how well that would be received by the family. So I started thinking pancakes again. The family can definitely get behind pancakes. And they love strawberries, so a light strawberry sauce wouldn’t be too hard to pass off. So I made my favorite pancakes and I topped them with strawberries and whipped cream. It still kinda feels like cheating, but at least it’s delicious! Pour 3-4 tablespoons of batter onto a hot, greased skillet. Cook for 1-2 minutes or until browned, flip and cook on the other side. 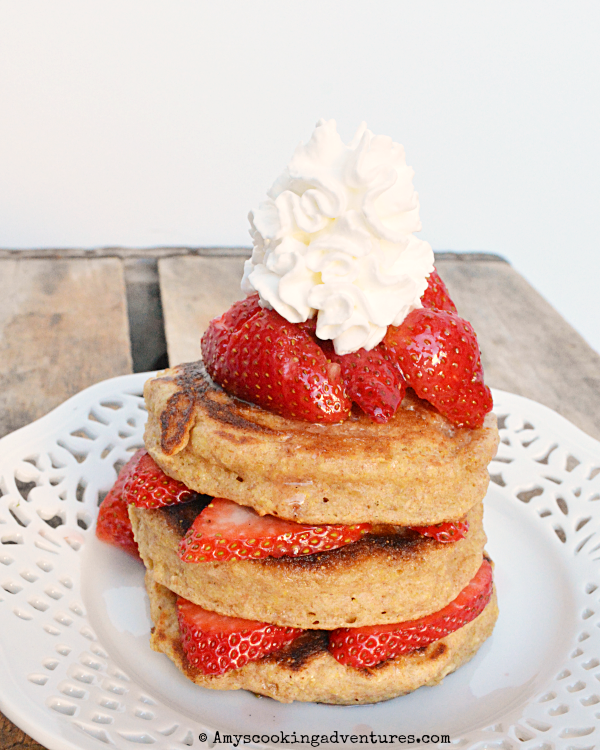 To serve, layer strawberry slices between the pancakes. Top with sweetened strawberries and a dollop of whipped cream! Great minds think alike. I couldn't get enough of this. I don't eat a lot of pancakes but I surely did on Sunday! Such fluffy and tall pancakes! What a great idea for breakfast! 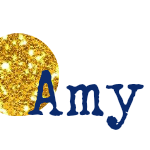 I think it's the perfect strawberry shortcake Amy. These look so hearty and delicious! Nice inspired take! What a great intro to Strawberry Shortcake! Your pancake recipe sounds delicious! Nicely done! 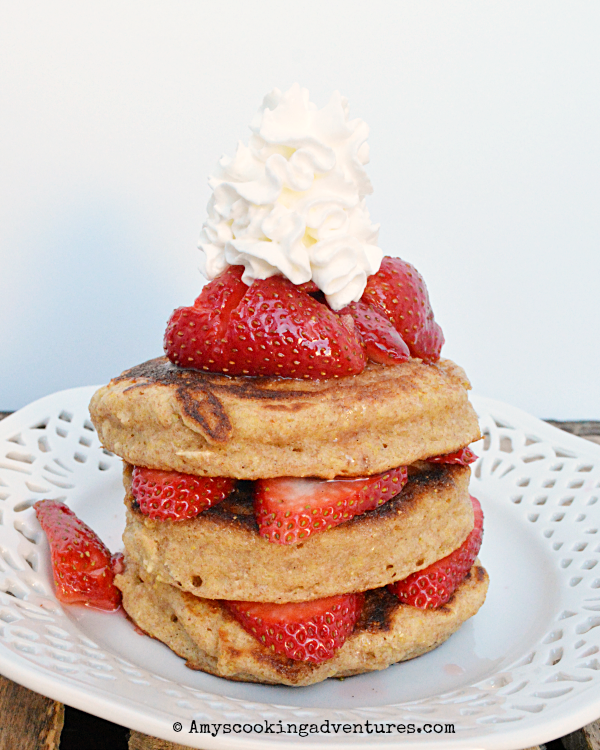 For me, strawberry shortcake was always on a spongey like cake that wasn't too overly sweet, but for this challenge, pancakes are TOTALLY OKAY!! They look so tasty - definitely a breakfast I could eat over and over again.